When my husband and I found out we were pregnant with our first born we were ecstatic. It had taken us a couple years to conceive and the idea that there was an actual person growing inside of me that had our combined characteristics and genetics was thrilling. Anyway, we scoured name books, we visited name websites, we discussed names, we wrote them down, second guessed, and pondered. For me, naming a child has always been exciting. I always wonder exactly how people come up with their kids' names. Is it a family name? Is it from a television show? Is it just something they like the sound of? Does it have a really special meaning? I've found the process is very different for everyone. From biblical to old fashioned, trendy to classic, hippie names, family names... From the people who have names picked out before they're even pregnant to the couple who takes several days after the baby has been born to see what name fits. There's no one right way to choose a name. As someone who has a less than common name (at least in the states) I know what it's like to not be able to get a pencil or bike license plate that has my name printed on it. That never stopped me from looking. I *always* looked hoping to find a mug that said Melissande printed on the side. No surprise that I never found one. I wanted my name to be Stacy when I was growing up. As a child of the eighties Stacy was a common mug name and I thought it was beautiful. I did happen to be the recipient of several personalized ornaments with my name printed on them. I still have them. They're kind of special to me. I put them on the tree every year. All that said, I never missed out on anything big just because my name was different. Of course there was the moment when someone said my name was stupid. And, I always knew when a teacher had gotten to my name in class because a stutter and a look of surprise and panic would creep over their face. Sometimes I'd let them stammer through it and other times I would attempt to save them before I heard one of the various butchered versions of my name. Even after all that my husband (who has a common name) and I decided to give our children less than common names. When I say less than common what I mean is that their names do not appear on the top 1,000 most common names in the U.S. (I literally check the social security statistics). This is a criteria that I am not flexible on. It's our third girl in a row and that makes it a little bit more difficult. We've gone over a couple names and so far nothing has been "it" yet. I'm trying to be more open minded this go-around. We've been told that our children have "fantasy" type names and that's fine by me. I'm all about Lord of the Rings and if it sounds like my kids are a group of elves and dwarves that have jumped out of that book then I feel like I've won in life. Actually, I'm kind of a name geek. I nerd out over names and I love talking about them. Give me a name and there's a good chance I will know the meaning. I love talking to my friend Mary about names. That girl gets me. She is a name geek too. At any rate, we're still trying to name this baby and despite the fact that naming kids can be quite a job I have to admit it's a job that I absolutely love! 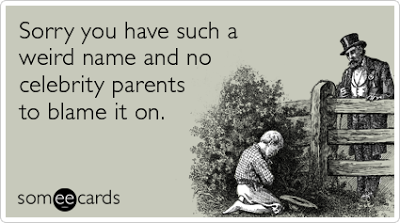 How have you come up with your kids' names? Do you have special criteria? 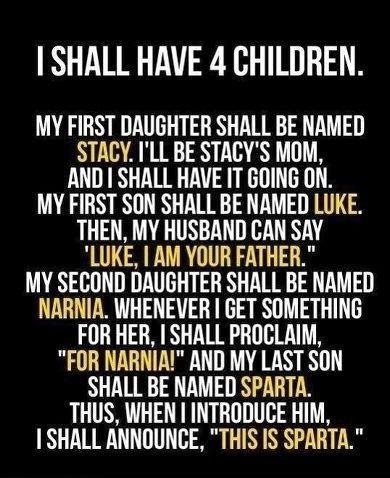 Naming babies is fun! We have four kids who are the same age, so we had quite a lot of discussions about naming. I'm sure your husband will come up with a great name for #5. Congratulations!